There are few culinary pleasures in life than anything slathered in cream cheese, butter, and milk. However, these dairy delights can turn any bland, healthy vegetable into a crave-worthy, yet tummy upsetting calorie bomb in no time. With the holidays fast approaching, I’m spending obscene amounts of time daydreaming about the smorgasbord of food that will be served on our dinner table. At the same time, I’m dreading the holiday bulge that inevitably leaves me feeling bloated and lethargic by the year’s end. Well, not this year! I have decided to find a way to transform some of my favorite Thanksgiving and Christmas dishes into healthier, lighter versions without sacrificing on the flavor. 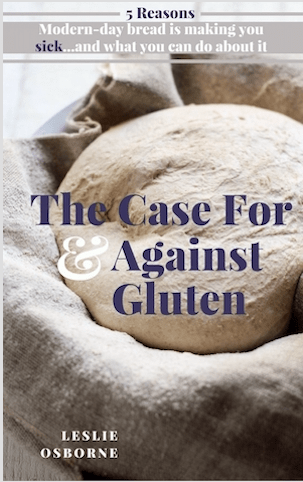 Now how on earth do you mimic the creamy texture of cream cheese, milk, and butter without resorting to lower-in-fat versions that often contain unnecessary additives and have been stripped of some of their essential nutrients? What a great question! 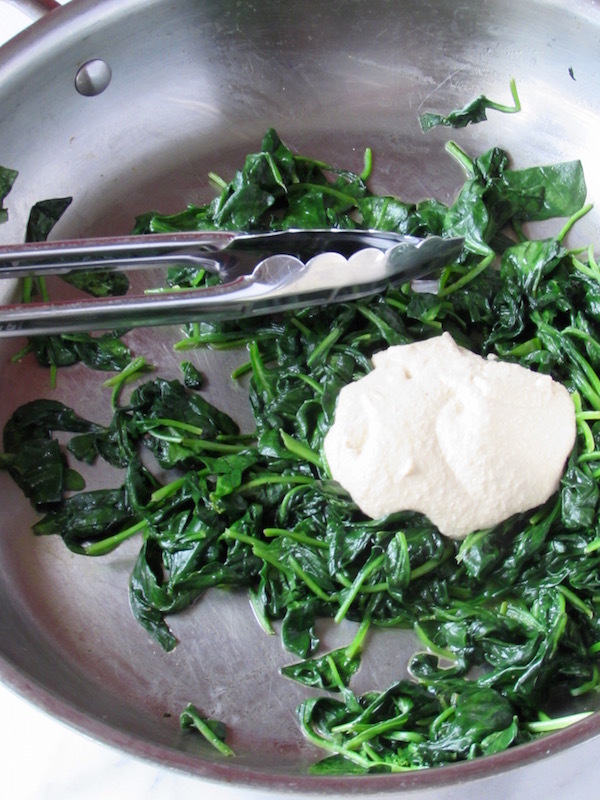 The answer….creamy cashew sauce. I have no idea what mad genius food scientist originally came up with this vegan alternative to creamy dairy sauces. But I know after trying it, I will be slathering any and everything I can think of with this extraordinary sauce. Trust me, I loooove cream sauces. When I make a pasta dish, I enjoy using heavy cream in the sauce I’m making. Maybe a bit too much…that’s why I try to avoid making it more than a couple of times per month. But now I have a base for transforming any dairy-filled dish with an equally satisfying vegan alternative, YEAH! 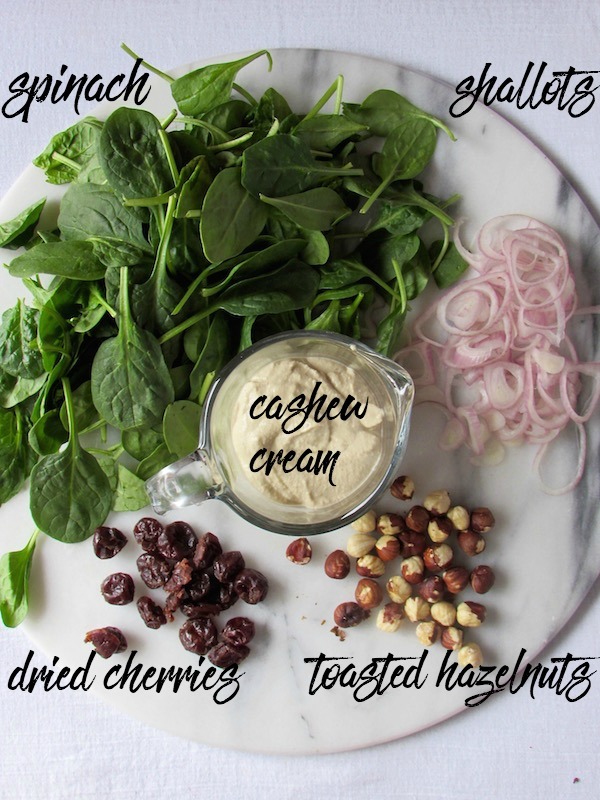 The inspiration for the cashew cream came from the Whole Foods Market recipe. I made some slight alterations, but overall the recipe is spot on. Start by soaking the cashews in water for 30 minutes. Rinse and drain them, and add the cashews, vegetable broth, lemon juice, salt, and nutmeg to the blender. Start by adding just 1/2 cup of the vegetable broth, then stream in up to 1/4 cup more if needed. Puree until it’s nice and smooth. Because everything comes together so quickly, I like to fry up the shallots next so they can drain while I’m sautéing the spinach. 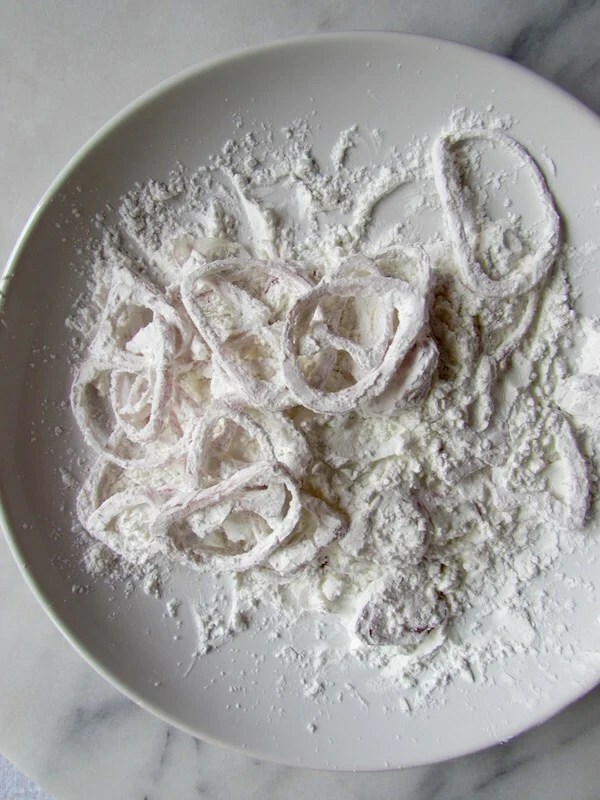 Coat sliced shallots in cornstarch or tapioca starch. Heat a skillet over medium high heat with enough oil (grapeseed or canola) to coat the bottom of the pan. The oil is ready when you add a pinch of the cornstarch and it starts to sizzle. Drop in some of the shallots, doing them in batches so as not to overcrowd the pan. If necessary, lower the heat to medium after the first batch because the oil might get too hot and burn the rest of the shallots. Season with salt and pepper as soon as they come out of the pan and eat half of the batch yourself. Chop and toast the hazelnuts in a dry pan if they are raw and soak the cherries in a touch of orange juice or water to help them soften. For this recipe I used about 10oz. of fresh spinach, but then realized it wasn’t quite enough for 4 servings so I adjusted the recipe below?. Now sauté a bit of onion over medium heat until softened and fragrant, then add a clove of garlic for one minute. It might seem like a mile high pile at first, but it will wilt very quickly. 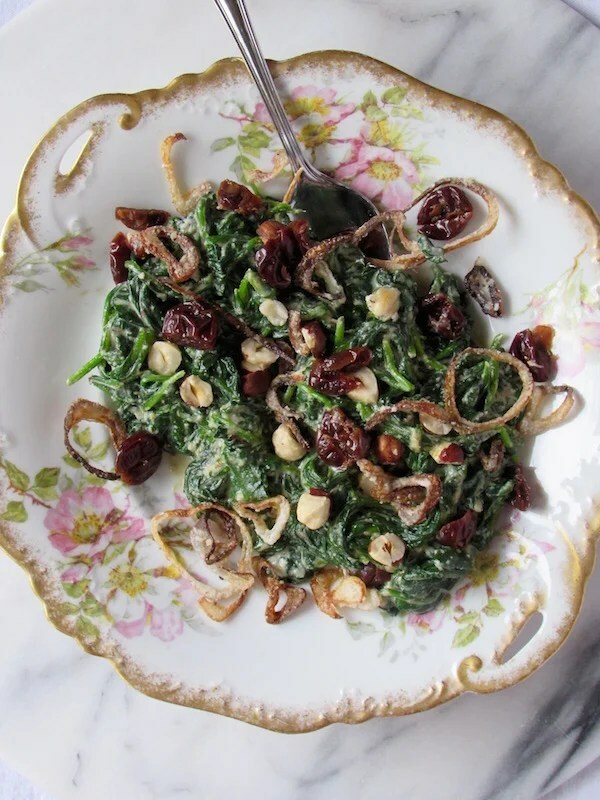 If you are making this for a larger crowd, wilt the spinach in batches, making sure to add a little onion and garlic to each batch. Or you can certainly use frozen spinach and just warm it in the pan with the onions and garlic before adding the cashew cream. If you need to transport this dish, simply add the creamed spinach to a casserole dish and pack the shallots in a paper towel inside a ziploc bag(let them cool first) or container to keep them crunchy. Pack the hazelnuts and cherries in separate bags too. When it’s time to reheat, add about one tablespoon of vegetable broth to the spinach and stir. Reheat in the oven until warmed through then add your toppings and serve. Yes folks, it tastes as creamy as it looks!!!! 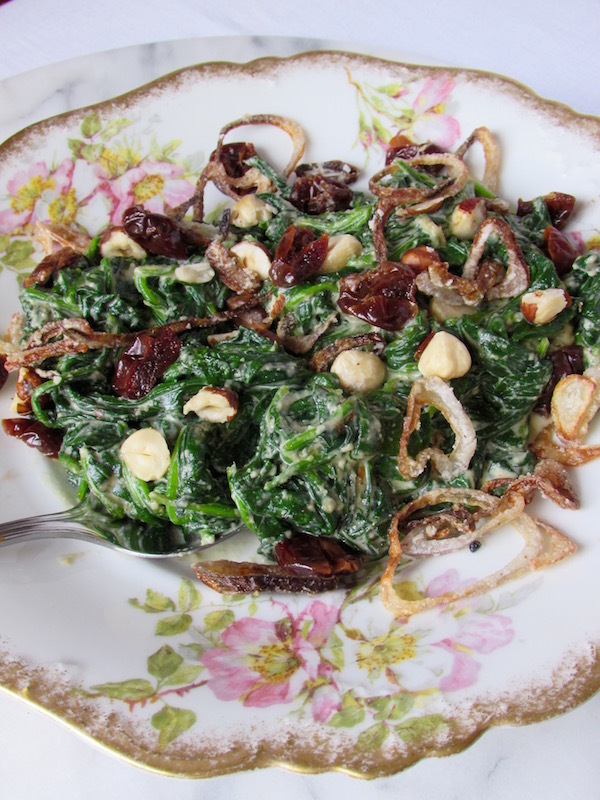 Vegan creamed spinach with cashew cream, crispy shallots, dried cherries, and hazelnuts will satisfy any dairy lover!! Soak the cashews for 30 minutes. Drain, then rinse. Soak the dried cherries in 3 Tbsp. orange juice or water to soften for about 10 minutes. Drain and set aside. Chop and toast the hazelnuts in a pan over medium heat until fragrant if using raw hazelnuts. 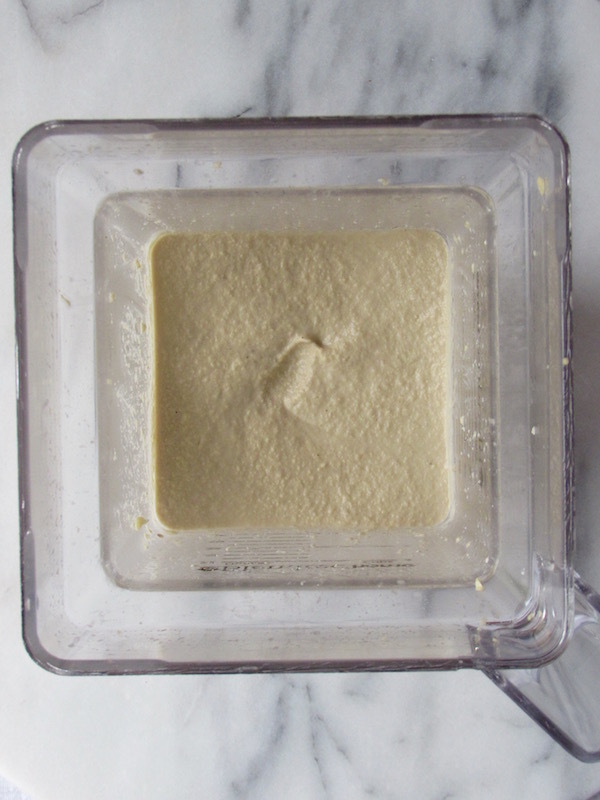 Add the cashews, vegetable broth, lemon juice, nutmeg, and salt to a blender and puree until smooth. Add 1/2 cup of vegetable broth at first, then stream in up to 1/4 cup more if needed. Heat a sauté pan over medium high heat with enough oil to coat the bottom of the pan. Coat the sliced shallots in cornstarch or tapioca starch. Fry the shallots in batches until golden brown. Adjust the heat after the first batch if it gets too hot. This will keep the shallots from burning. 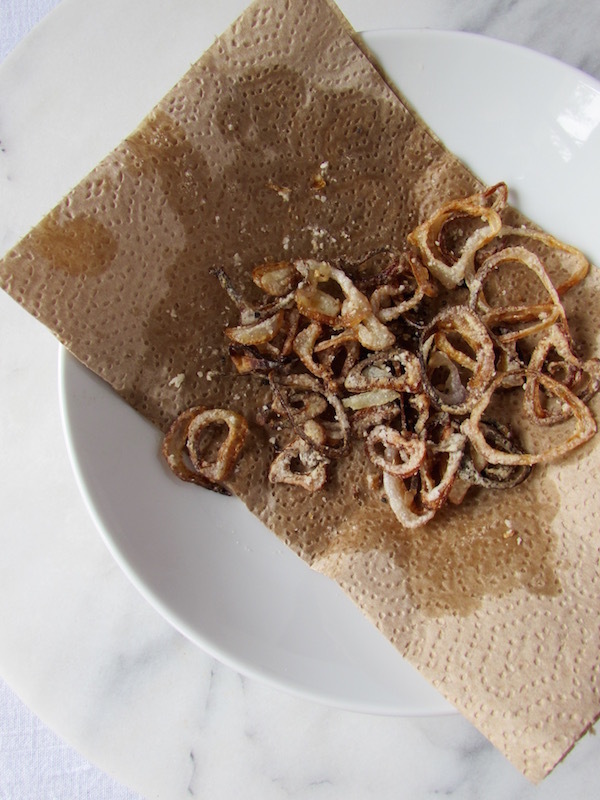 Drain them on a paper towel-lined plate and season with salt and pepper. Heat a large sauté pan over medium heat and add the onion. Sauté until softened and fragrant, about 2-4 minutes. Add the garlic and sauté for one minute. Add the spinach and sauté until wilted, about 1-2 minutes and season with salt and pepper. 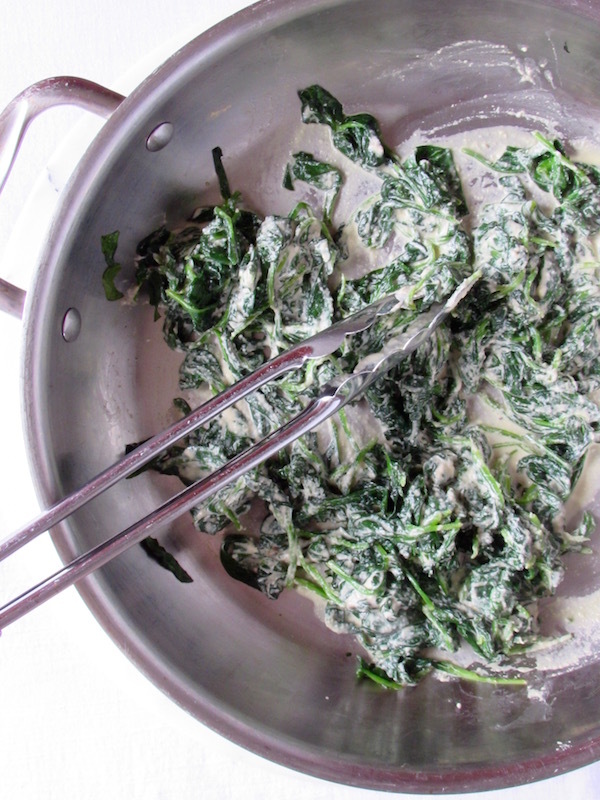 If you are using frozen spinach, heat through and evaporate the water that is released, season with salt and pepper. Add the cashew cream and stir until combined. Season with salt and pepper. Remove from heat and serve with the hazelnuts, dried cherries, and crispy shallots. Looks delicious, Leslie! I love the combination of ingredients. We are heavy spinach users — I’m pinning!! What a delicious recipe! I really love every single ingredient here. 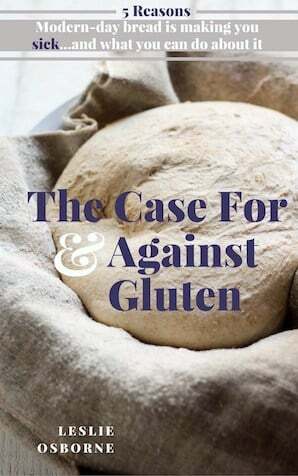 What a beautiful blog, and wonderful recipes like this one. Love the combo! It’s really flavorful, I hope you do Sandra! !